Pure cuteness! I know I need to get my Cricut out and start playing with her she's been sitting on her table for such a long time. LOL! Love that cartridge. 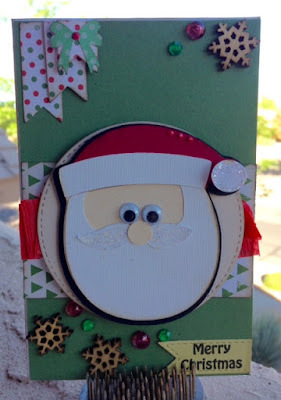 Thanks for joining my DL.ART DECEMBER LINKY CHALLENGE. Have a blessed day DIANA L.
Tooooooo cute - love it!!! Ooh, how SWEET! Look at that adorable Santa Face! Too Dang CUTE! Way too cute! Love that Santa ! Thanks for joining us this week at Die Cutiin Divas! Sooooooooooo cute! LOVING the Santa!!!!!!!!!!!! Adorable card! The Santa is way too cute! Thank you so much for visiting my blog, I really appreciate your sweet comments! So happy to see you back in the crafty world. Super DUPER cute my friend!! What a super cute card!! Love the adorable Santa!! Thanks for joining us at DCD this week! Thanks for joining Dcd’s this week!